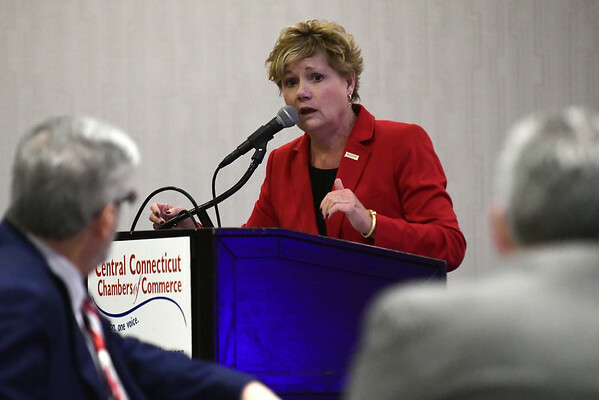 BRISTOL - The Central CT Chambers of Commerce have announced several upcoming programs next month. On June 6, The Bristol Chamber of Commerce will hold it’s free to attend 2018 Annual Meeting from 8 a.m. to 9:30 a.m. at Doubletree by Hilton at 42 Century Drive and their 129th Annual Awards Dinner. Attendance is $70 per person, starting with a reception at 5:30 p.m. followed by the program at 6:30 p.m. at The Aqua Turf Club at 556 Mulberry St. People can register for these programs by visiting centralctchambers.org or calling 860-584-4718. At the Awards Dinner that same night, the Outstanding Community Service Award will be presented to the past and current board members of the Bristol Boys & Girls Club. The Special Recognition Award will go to Environmental learning Centers of Connecticut, Inc. The Volunteer of the Year award will be given to Linda Lubrico. The Mum Festival Committee will receive the Spirit of Bristol award. “Their summer festival brings so much energy and excitement and so many people to our downtown,” said Bombard. Emily’s Catering Group will be presented the Distinguished Business of the Year Award. The E. Bartlett Barnes Distinguished Service Award will be given to Timothy W. Furey. Then, on June 13, the Chamber will hold its 2018 State of the City & Towns Breakfast at Chippanee Country Club at 6 Marsh Road. The dinner will begin at 7:30 a.m. followed by the program from 8 to 9:30 a.m. Panelists will include Bristol Mayor Ellen Zoppo-Sassu, Plainville Town Manager Robert E. Lee, Plymouth Mayor David Merchant, Wolcott Mayor Thomas Dunn, Farmington Town Manager Kathleen Eagen, Burlington First Selectman Theodore Shafer and Bloomfield Town Manager Phil Schenck. Admission is $25 for chamber members or $35 for non-chamber members. People can register by visiting centralctchambers.org or calling 860-584-4718. Brian M. Johnson can be reached at 860-973-1806 or . Posted in The Bristol Press, Bristol, General Business on Friday, 18 May 2018 21:29. Updated: Friday, 18 May 2018 21:31.